Ceramics are some of the most abundant objects found on archaeological sites. Despite being breakable objects, fragments of ceramic vessels (called sherds) are relatively stable and survive very well, even in a waterlogged environment. As you have followed along in our blog, I am sure you have gotten the sense of how important salt removal is to most material. Ceramics are no exception. Salt can cause the greatest long-term damage to ceramics, and it is the first thing to be addressed in its conservation. Latent salt will recrystallize as it dries, and the expansion of salt crystals causes irreversible damage to ceramics. Once soluble salt is leached out over a series of water baths, ceramics can be safely dried. Occasionally, ceramics can be quite brittle or weakened and must be re-strengthened, or consolidated, using a dilute form of adhesive. Stain removal is sometimes attempted, if the glazing or clay will not be adversely affected by the acids commonly used to achieve this. After all the sherds from a vessel are dry, the fun part really begins: reconstructing the vessel. The sherds are laid out, and broken edges are checked against each other for possible joins. Like a 3D puzzle, a vessel slowly takes shape as sherds are glued together. Depending on the vessel size or fragility, an interior form may be used to help support the structure, and gaps where a sherd is missing can be filled using plaster which is then painted to resemble the original section. In addition to stabilizing ceramic vessels, conservators must also be aware of what kind of information can be learned from ceramics so that treatment will not interfere with that analysis. The origins of pottery can be identified using different techniques. Not only can the shape of a vessel reveal the age or nationality, but other scientific testing can help us gain a better understanding of ceramics from a site. Analysis of glazes can help identify the origins of pottery. By also studying the petrography, or the mineral makeup of the clay, ceramic clays can be attributed to specific geographic regions. Resins were often used to line the interior of ceramic vessels containing liquids. These resins can be examined to determine their origin, and they can be sampled for pollen. Pollen analysis, or palynology, may reveal the contents of the vessel, which in turn may reveal information about the diet of the last people to use the vessel. Careful conservation helps to preserve these fragile pieces of information found in the archaeological record. -Buys, Susan and Victoria Oakley. Conservation and Restoration of Ceramics. Oxford: Butterworth-Heinemann, 1993. -Price, T. Douglas and James H. Burton. An Introduction to Archaeological Chemistry. New York: Springer, 2011. 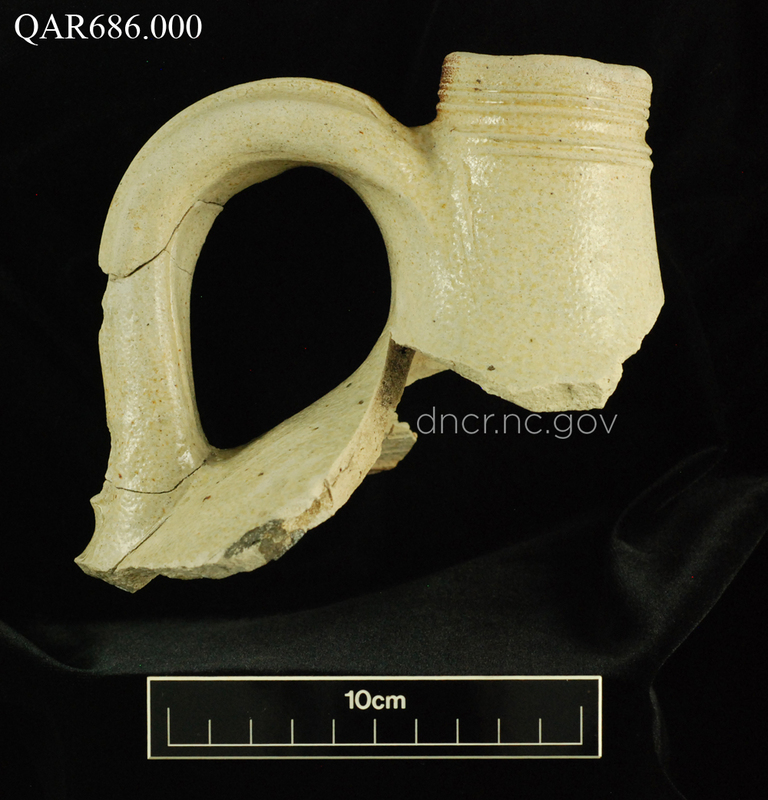 -Reconstructed saltglaze stoneware from Queen Anne's Revenge shipwreck, image by NC Department of Natural and Cultural Resources. 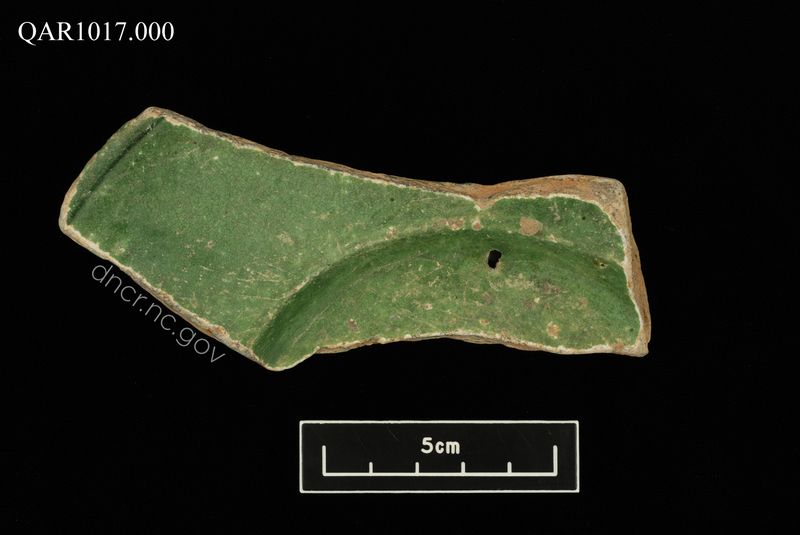 -Green glaze from the Saintonge region of France, from Queen Anne's Revenge shipwreck, image by NC Department of Natural and Cultural Resources.